My intent with these short essays has been to trace parallel female figures to the two Johns depicted in the Introduction course – Mary Theotokos parallels John the Baptist, Mary of Bethany parallels John the Beloved. In the course of those explorations, we discover that the parallels aren’t direct – both Mary images deepen as well as mirror the John images. These are people after all, not mere symbols; they are themselves. So let’s take one more step by looking at yet another Mary – the Apostle to the Apostles, the Disciple beyond compare, The Magdalene. The image for this blog is an icon by Robert Lentz depicting a traditional story about her. One tradition concerning Mary Magdalene says that following the death and resurrection of Jesus, she used her position to gain an invitation to a banquet given by the Roman Emperor Tiberius. When she met him, she held a plain egg in her hand and exclaimed, “Christ is risen!” The Emperor laughed, and said that Christ rising from the dead was as likely as the egg in her hand turning red while she held it. Before he finished speaking, the egg in her hand turned a bright red and she continued proclaiming the Gospel to the entire imperial house. What I love about this story is that it vividly depicts Mary’s personal power. She isn’t a timid follower of Jesus, she is a significant woman of renown who stands up to emperors to speak the truth. In the canonical gospels, she communicates the news of the Resurrection to the apostles, but in gnostic scriptures like The Gospel of Mary, she goes much further. 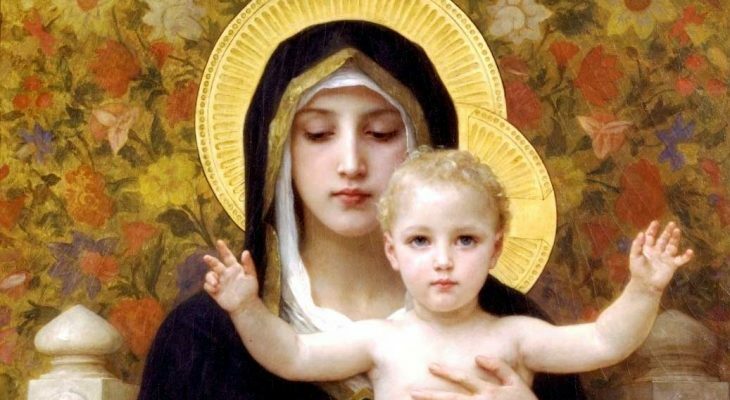 […] Mary stood up, greeted them all, and said to her brethren, Do not weep and do not grieve nor be irresolute, for His grace will be entirely with you and will protect you. But rather, let us praise His greatness, for He has prepared us and made us into Men.When Mary said this, she turned their hearts to the Good, and they began to discuss the words of the Savior. Peter said to Mary, Sister we know that the Savior loved you more than the rest of woman. Tell us the words of the Savior which you remember which you know, but we do not, nor have we heard them. Mary answered and said, What is hidden from you I will proclaim to you. … and she does, laying out a complex doctrine of human freedom attained by defeating the hold of the ruling powers over the human soul. Peter – never the sharpest chisel in the toolbox – doesn’t follow. Mary depicts a human being entering the fullness of spiritual insight, the Word flowing through her as she teaches. She isn’t merely one who has learned, she is one who Knows. What’s Johannite for me about this image isn’t her forthrightness or her certainty, it’s her transformation. The Magdalene earlier in the gospels is a much milder, more humble figure. 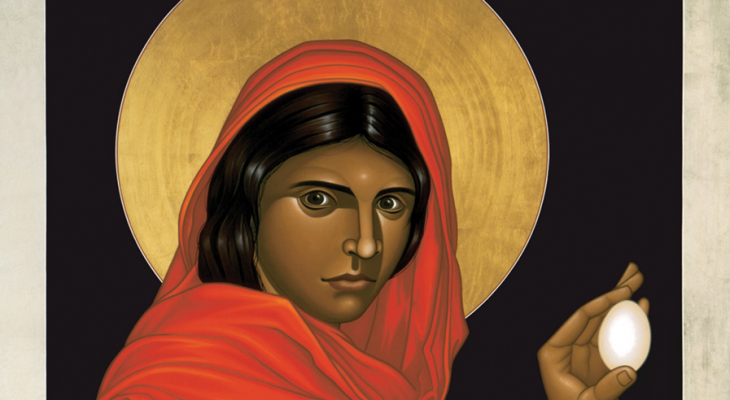 Prior to the crucifixion, she is one among the followers of Jesus – but as the story advances beyond the death of Jesus, she emerges as this striking, powerful figure. Just as we see with the later stories around St John, Mary is depicted undergoing a profound transformation from follower to teacher. This transformation also depicts a crucial aspect of the Johannite understanding of Jesus as not merely teacher, but as an exemplar – his life depicting a path which others… which we… might follow. This is crucially different to the Jesus most of us grew up with who is a singular figure worthy of devotion and worship, but not someone we might hope to emulate. For us, Mary Magdalene (and John the Beloved later in life) depicts full human spiritual maturity, which is not simply to echo Christ, it is to be Christ – to fully realise throughout your being the total unity between the Logos and human nature. Sept 23: Patriarchal Visit to Holy Grail Narthex, Montreal, Que. The Apostolic Johannite Church is pleased to announce an official visit by the Patriarch of the Apostolic Johannite Church to Holy Grail Narthex in Montreal, Que, Sunday September 23rd, 2018 at 6pm. The Patriarch will be celebrating the Contemplative Eucharist together with Rev. Subdeacon Jonathan Stewart and Holy Grail Narthex at Présence Meditation Center, located at 207 rue St. Viateur Ouest. The Contemplative Eucharist is a Rite of the Apostolic Johannite Church which emphasizes silent contemplation and is practiced together with meditation and the ancient practice of Lectio Divina. 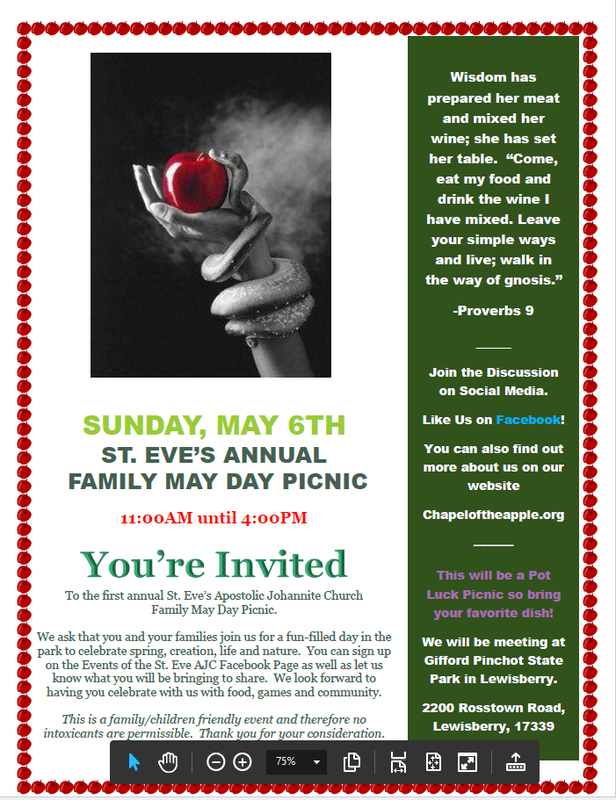 All are welcome to attend and take communion. Following the Eucharist, there will be dinner at a locally selected restaurant, for informal conversation and discussion. It has been said that to be a Johannite is to be a Marian – a devotee of Mary. I think this is true in several interesting ways. There is an old tradition, grounded in Patristic sources, that St John the Evangelist and Mary, the mother of Jesus, led the community at Ephesus together. Among the ruins of Ephesus today, there remains a house remembered as the house of the Virgin Mary. 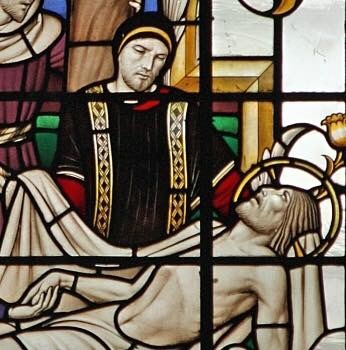 To connect our several Johns with our various Marys in a different way, many theologians consider John the Baptist and the Blessed Virgin to be the final prophets of the Old Testament. So, what I’d like to do in this short pondering is to approach Mary in a similar way to the way we approached John the Baptist in the Concepts course – by way of art as a means of entering into as aspect of Johannite tradition. This will wind its way into the Concepts course eventually. Just as I did with the Baptist, I’m going to focus on one type of depiction of Mary. The variety of depictions of her is so vast, her titles so profuse and devotion to her so profound, that it’s almost impossible to try to encompass it all, so I’m not going to try. I’m just going to pick one type and one example of that type that, as it happens, I rather like. One Mary’s many titles, one of the oldest, is Theotokos (Θεοτόκος), literally God-bearer. It’s more usually translated by the English term “Mother of God”. The accuracy of the term was a matter of significant dispute in the early church because it relies on a specific understanding of who and what Jesus was. But it finds it echoes in many examples of both Orthodox and Catholic art. The feature image up top is “La Vierge au lys” (1899) by William Bouguereau (1825-1905). Bouguereau was considered a hack by his Impressionist contemporaries, but I think his luminous, hyper-realist work has aged rather well. The one I want to focus on is an earlier piece, “Madonna and Child” (1888). Despite its slight flatness, I like this version because it’s more straightforward. As you can see, it depicts Mary as bearer of Jesus in both senses of that word in English – mother and carrier. Madonna and Child is a classic theme in paintings and icons and they are almost always simple. Mary is seated. Jesus sits on her, she holds him. It’s almost a natural pose of a mother and her child, except that he is almost always facing outwards toward the viewer, toward the world. This isn’t that odd, mothers often hold children that way when they’re showing them off in some way. But while this is sort of that, it’s also something else. Rejoice, you through whom joy shall shine forth. Rejoice, you whom the curse will vanish. Rejoice, the Restoration of fallen Adam. Rejoice, the Redemption of the tears of Eve. Rejoice, O Height beyond human logic. Rejoice, O depth invisible even to the eyes of Angels. Rejoice, for you are the King’s throne. Rejoice, you bear Him, Who bears the universe. Rejoice, O Star revealing the Sun. Rejoice, O Womb of divine Incarnation. Rejoice, you through whom creation is renewed. Rejoice, you through whom the Creator is born a Babe. 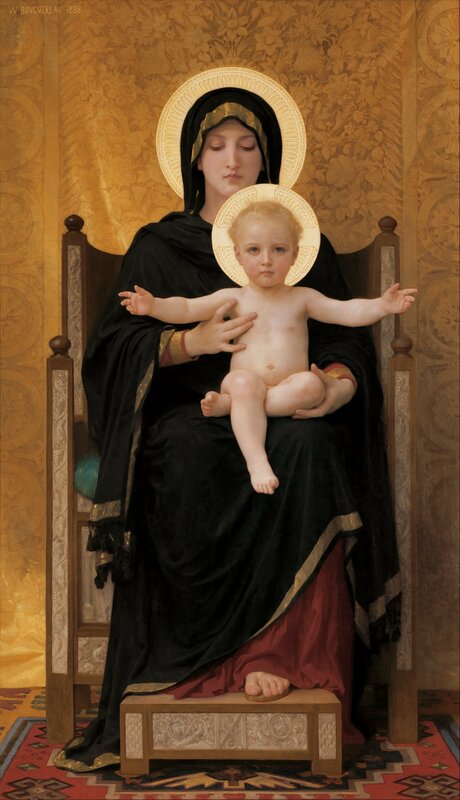 She is his mother in these pictures, but what you see so clearly in Bouguereau’s work is that she is also the Lord’s throne. This is, as Margaret Barker likes to say, temple talk. In the First Temple in Jerusalem, the Lord’s throne in the Holy of Holies is also Wisdom, who is also the Mother of the Lord – in the typically sliding semiology of Temple life. Mary has a long connection to the Temple. There’s a tradition that she was one of the young women charged with weaving the temple veil that is drawn in front of the Holy of Holies. Symbolically, depicting Mary as the Throne connects Jesus to the Royal Priesthood and to the First Temple. This parallels the Baptist acting as connection to Primordial Tradition. In both cases, his teaching is grounded and validated in deeper, older tradition, even though it was rejected by his immediate contemporaries in the Second Temple priesthood. The Theotokos and the Baptist connect to the past. The Evangelist and the Magdalene connect to the future. More on that next week. The other parallel that occurs to me is that both of them characterise modes of surrender. The Baptist surrenders his prominence in favour of Jesus (this is possibility a Gospel fiction, rather than anything that happened, but let’s go with it). You yourselves bear me witness, that I said, ‘I am not the Christ, but I have been sent before him.’The one who has the bride is the bridegroom. The friend of the bridegroom, who stands and hears him, rejoices greatly at the bridegroom’s voice. Therefore this joy of mine is now complete. He must increase, but I must decrease. Mary’s surrender is to God’s will that she become Mother to the Lord. Mary said to the angel, “How will this be, since I am a virgin?” And the angel answered her, “The Holy Spirit will come upon you, and the power of the Most High will overshadow you; therefore the child to be born will be called holy—the Son of God. […] For nothing will be impossible with God.” And Mary said, “Behold, I am the servant of the Lord; let it be to me according to your word.” And the angel departed from her. This willing surrender to allow the ego and ultimately the self to drop into the background as Christ takes up the foreground is, I believe, a key aspect of a deep, spiritual path. I’ll say more in the context of the Johannite practice course. In the meantime, enjoy the Bouguereau. You’re welcome. Like a good meal, Conclave takes some significant time and effort to prepare, and yet passes by quickly but without fail, we always leave full. Also like a good meal, it both refreshes us from the work we have done prior, and fortifies us for the work ahead. This year’s Conclave restored many, and nourished even more and our cup has truly run over with many great moments of fellowship, education, and connection. It also fortifies us for the work ahead with many new steps and commitments being made- a baptism, a confirmation, three minor orders, one subdiaconate and two sets of solemn vows. Solid people making solid strides in their own spiritual journeys both individually and together in the Johannite Church. It was deeply enriching to hear and see the work being done in our Parishes, Narthexes and Missions, as well as the Order of the Temple and Saint John. Being able to meet, discuss and share our journeys and work, reflecting and learning from each other’s difficulties and successes, is a kind of greenhouse which promotes healthy spiritual and organizational growth. Importantly, it also places our spiritual work in the context of something much greater than ourselves alone. I want to extend my thanks to our many fine speakers and presenters- Stephen O’Shea and M Isidora Forrest, Father Joseph Wolf, Erik Arneson, His Grace Mar Thomas, Msgr. Scott Rassbach, The Rev. Deacon Jason Campbell, Brother Mark Donato, The Rev. Mr. Jonathan Stewart, and Bro. Benjamin Pierce. Each of these teachers and seekers have given us much to explore, work on and consider in the journey ahead. I want to extend additional thanks also to Bishop Steven Marshall of the Ecclesia Gnostica and Queen of Heaven Gnostic Church, for welcoming many of our people who were fortunate to attend service on the Friday evening of Conclave. Lastly and most importantly, a special thanks must go out to our Conclave committee, Msgr. Scott, Sr. Constance and Rev. Jason who made things happen both in planning and in execution- but especially Sr. Constance Crain, who worked tirelessly to organize and move people. She has proved a worthy successor to the efforts and people of Conclaves past and an example for those who will step into her shoes in conclave planning to come. On behalf of the Apostolic Johannite Church, please accept my gratitude for excellent work. Fresh from spiritual and physical nourishment, we now collectively turn our eyes towards the year to come, and with this last writing from my keyboard on Conclave 2018, I’m pleased to deliver you the first news of Conclave 2019, its location. We return after more than a decade absence to the True North, strong and free, Canada. Montreal, Quebec, Canada to be exact. and experiencing through it, the initiation from death to life. Divine Beloved, out of the tomb of separation you have called us, to rise into the Kingdom of God. The ancient mysteries of sacrifice speak to our journey. May we never fear to descend into our lowest reaches, like the Logos and the harrowing of hell, to reconcile the lower with the higher- that we may rise transformed in this very life, and in the fullness of time ascend into perfect union. My blessings, good wishes and prayers for all the Johannite Parishes, Narthexes, Missions, and our solitary sisters and brothers, and all those who call the Apostolic Johannite Church home, deepening and sharing their journey here. My thanks and gratitude on behalf of the Apostolic Johannite Church to the Johannite Bishops, Priests, Deacons and Seminarians , the Grand Master and Initiates of the Friary, the Prior and Oblates of the Order of the Temple and Saint John, the Gnostic Wisdom Network team, and the Conclave Committee of the AJC, for all their hard work and dedication- not only to the people we work on behalf of, but also in their own spiritual paths and in their service to each other. Blessings and good wishes also from the Apostolic Johannite Church to the many Churches and communities of good will, especially the Order of Ste. Esclarmonde, the Ecclesia Gnostica Mysteriorum and Ecclesia Gnostica, as well as the many Martinist Orders and Lodges, our Masonic sisters and brothers, and also the many individual friends, family, laity and clergy of good will. May your work be noble, your spirits be humble, and your hearts always full.